Matt Marrese of Bellevue, WA and Marianne Li of Bellevue, WA won the 2014 Pacific Northwest Junior PGA Championship presented by Under Armour and Genesis Networks on June 1, 2014 at Lake Spanaway GC in Tacoma, WA. 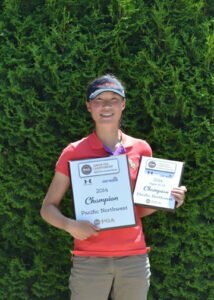 By winning the boys’ and girls’ divisions respectively, Marrese and Li qualified for the 39th Junior PGA Championship presented by Under Armour and Genesis Networks, July 29-Aug. 1, 2014, at Miramont Country Club in Bryan/College Station, Texas. 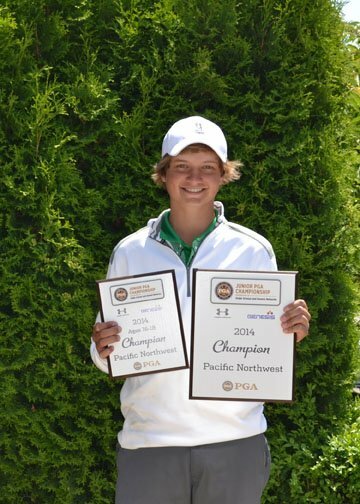 Marrese, 17 posted a final-round 69 for a two-day total of 139 and a one stroke victory over John Sand of Hoquaim, WA. Li, 17 had a final-round 72 for a two-day total of 142 and a one stroke victory over Olivia Benzin of Tacoma, WA. The Junior PGA Championship, Presented by Under Armour and Genesis Networks, is open to one boy and one girl champion from each of the 41 PGA Sections, champions of the eight PGA Junior Series events, select national junior tournaments conducted throughout the year and special invitees who have yet not reached their 19th birthdays as of the final round of the championship. The Junior PGA Championship has traditionally been a stepping-stone for many of today’s PGA and LPGA Tour professionals as well as current collegiate stars. Past Junior PGA Championship competitors who have gone on to successful professional careers include: In-Bee Park, Jim Furyk, Luke Guthrie, Trevor Immelman, Cristie Kerr, Justin Leonard, Michelle McGann, Phil Mickelson, Grace Park, Dottie Pepper, Jordan Spieth, David Toms, Lexi Thompson, Michelle Wie and Tiger Woods. To view results, please CLICK HERE. The 39th Junior PGA Championship presented by Under Armour and Genesis Networks, is open to one boy and one girl champion from each of the 41 PGA Sections, winners of the nine PGA Junior Series events and a other select national junior tournaments conducted throughout the year and special invitees who have not reached their 19th birthdays as of the final round of the championship. Celebrating its 98th year, The PGA of America has maintained a twofold mission of its founders: to establish and elevate the standards of the profession and to grow interest and participation in the game of golf. By creating and delivering dramatic world-class championships and exciting and enjoyable promotions that are viewed as the best of their class in the golf industry, The PGA of America elevates the public’s interest in the game, the desire to play more golf, and ensures accessibility to the game for everyone, everywhere. The PGA of America brand represents the very best in golf.